Gone to See Europe. Semester at Sea Spring 2013 Enrichment Voyage on the MV Explorer. Day 45: At Sea between Stockholm and Copenhagen. 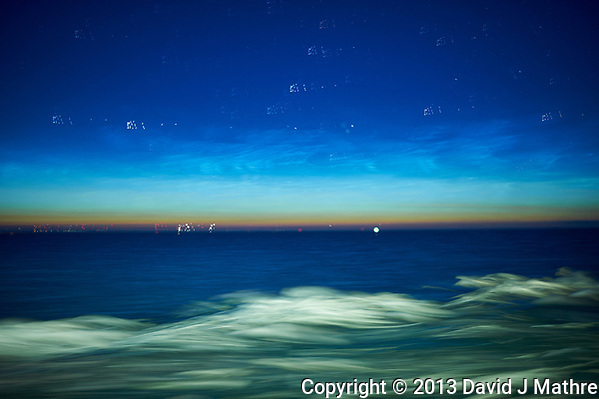 Late night or early in the morning (hard to tell this far north when there isn’t much darkness at night) I looked out my cabin window on the MV Explorer and saw the electric blue Noctilucent clouds. I read about them before (http://www.spaceweather.com/), but had never seen them. The clouds are ice crystals that are very high that you can only see for a short time when the sun is below the horizon. One theory is the crystals are nucleated when micro-meteors pass through the upper atmosphere. We were in the Baltic Sea traveling from Stockholm to Copenhagen and the sun doesn’t set until very late I set up a camera in my cabin and started taking pictures. (Nikon D4 camera, 28 mm f/1.8 lens (ISO 200 or 800, 28 mm, f/1.8, 1 sec)). 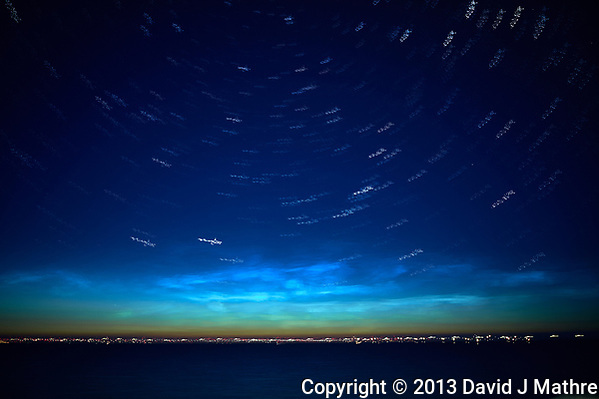 The composite images were generated using Photoshop CC (statistics, maximum) the way I do generate star trails. 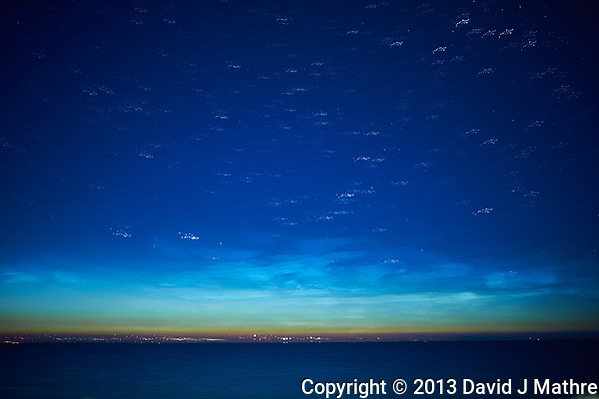 I was impressed that you can see the star trails looking north, even though this is a composite of images taken on a moving ship at sea. The seas were pretty calm that night (early morning).